It’s been an exciting couple of weeks for Scene Change, a British Council Cultural Skills Unit project produced by People’s Palace Projects. 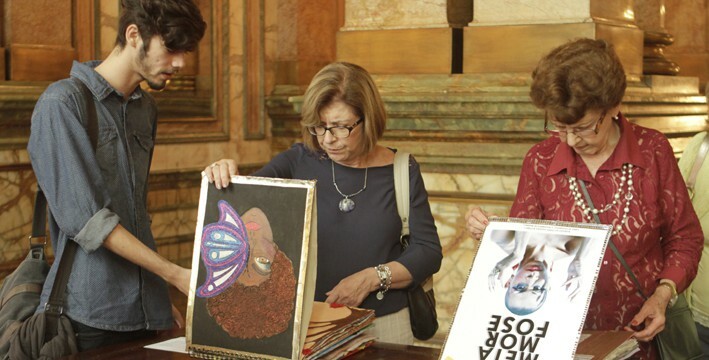 The project is themed around Puccini’s opera Madama Butterfly, and earlier this month, 16 “inspiration notebooks” (sketch portfolios) created by 100 students from Spectaculu Design School in Rio de Janeiro were showcased in the magnificent surroundings of Theatro Municipal, Rio’s Opera House. The quality of the students’ work was stunning and the Theatro Municipal’s creative team and People’s Palace staff were genuinely blown away – do check out the images below. Now in 2015, it will be the UK’s turn! Scene Change aims to promote an educational exchange between Brazilian and UK organisations, focusing on young people and creative industry. The exchange of experiences happens through a methodology called Design Challenge – a competition programme for young students promoted by the Royal Opera House – which connects 500 British educational institutions. The methodology offers practical work experience in the creative industries, focusing on four different areas: Costume design, Make up, Set design and Digital Marketing. For this edition of Scene Change, the exchange revolves in the UK around High House Production Park (Thurrock), Creative and Cultural Skills and the Royal Opera House (UK); and in Brazil around Theatro Municipal, Funarte (the national Foundation for the Arts) and Spectaculu in Rio de Janeiro. The students were given a live brief based on real life creative roles and tasks. Each year, the competition is themed on a production in the Royal Opera House’s current season – this year, Madama Butterfly. The student participants receive a briefing on the actual production from a director, and their work in creating their designs mirrors that of the ROH’s professional team. Theatro Municipal committed wholeheartedly to the project to the extent that they remounted their own production of Madama Butterfly on their main stage in late November and early December. This enabled the Spectaculu students to follow the professional production process in detail, including watching the final rehearsals for the Opera, and to create their own designs alongside it. During the exhibition of their work at the Theatro Municipal, 20 Spectaculu students were present to speak to visitors about their vision, concepts and the way they had developed their designs. Over 100 students were also invited to watch the Opera during its short season. In March, it’s time for the British students to do the same in London: they will watch Madama Butterfly and present their portfolios at the Royal Opera House. Meanwhile, the exchange between the Rio and London student participants will be ongoing by digital means, through photos and posts on a FLICKR account. The inspiration brochures are the young students’ creative portfolio, developed by them under the artistic direction of visual artist and Spectaculu President Gringo Cardia. The notebooks comprise pictures, short films, fabric swatches, illustrations and sketches about Puccini’s masterpiece.